Happy New Year! It will now take me approximately 3 months to readjust from writing 2014 on everything to now writing 2015 (I can't be the only one that struggles with that). I hope y'all had a great night spent with friends and family celebrating the excitement of a new year. With the new year typically comes loads of resolutions and the optimism to keep them for the entire year. Since resolution has slowly taken on a negative connotation I am instead going to make some goals for the upcoming year. As I mentioned in my post yesterday the reasons resolutions don't exactly turn into commitments is more than likely due to not having a plan to accomplish them. It's great to set goals but without thinking of ays you can accomplish them then they are going to remain goals instead of accomplishments. 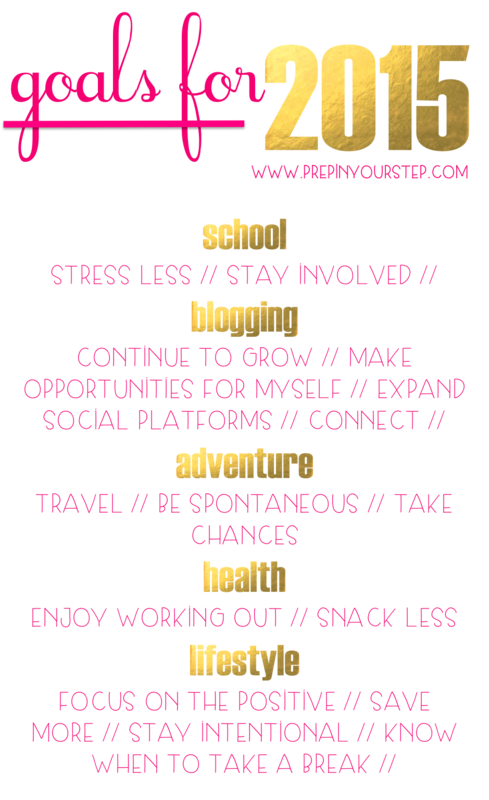 Here are my goals for 2015 as well as different strategies and actions I can take to reach them! I've separated them into categories in order to have a set focus on what aspects of my life these goals are working to better. stress less… To focus on this one I am going to try my best to keep things in perspective and take things from week to week if necessary. I have a tendency to get bogged down by all the to-dos shouting at me from the pages of my agenda and I need to remind myself that it will all get done. stay involved … I've already become more involved throughout this school year but I am hoping to take on more responsibility as this new year progress. By performing the roles I currently have to the best of my ability and going above and beyond what is expected from me my involvement will surely be making a positive difference. continue to grow… 2014 was amazing for my blog. I have been so lucky to gain so many engaged readers and I hope this trend continues into 2015.
make opportunities for myself… In the past I have been more inclined to wait to see if any cool opportunities come my way but this year I want to be bolder and create these opportunities for myself. Whether that means emailing someone out of the blue or taking on a different job the transition would be part of the fun. expand social platforms… I want to be able to update different aspects of social media more frequently and continue to add platforms to reach out to people on. I know y'all adore it when I have videos and hopefully these will begin to become more consistent as a result of that! I've already started this goal by making my blog a Facebook page, i'd love it if y'all wanted to check it out and like it here! connect… Having readers and followers is probably the coolest part of blogging and I would love to connect with y'all in as many ways as possible. I'll have to brainstorm the best ways to do this but stay tuned! travel… This is already well in the works for 2015 as I plan to travel to Paris and London this summer. Whether it is taking a weekend trip to a nearby town or traveling across the globe by adventuring in these ways I will surely be inspired and have cool stories to share upon my return. be spontaneous… Being a planner this can be especially difficult. I am hoping to forget the schedule sometimes and instead say yes to fun events and outings instead of fearing that everything won't be able to be finished because of it. take chances… This goes along with being spontaneous pretty effortlessly. By taking chances that I am not usually that inclined to do maybe I will discover another hobby or meet new people. I''m always nervous to try something new because I tend to fear that I may not be good at something or know anyone so hopefully I can get these qualms out of my head! enjoy working out… I really do like working out which some would consider lucky. By being excited to get a good workout in while listening to fun new music I will definitely be more motivated to hit the gym. snack less… I have always been a snacker, especially when it comes to sweets. This year I am hoping to be able to find (it's an actual search in the Dining Hall at school) more filling meals allowing me to not be tempted to snack as frequently. focus on the positive… I promise I am not a negative Nancy but this is something I feel like everyone can improve on. Viewing situations in a positive light will definitely reduce some stress and give me something to laugh about in the future. save more… Since I will be traveling more I definitely want the money I make to go to more meaningful purposes than just the newest and cutest shirt from J.Crew. This will hopefully be accomplished by automatically putting aside most of the money I make into an account that can't be accessed and drained by the swipe of a card. stay intentional… I have always thought of myself as being very intentional. I make a point to reach out to friends when they have a big event occurring in their lives and checking in frequently. I will definitely be adding in important opportunities and events that my friends have into my planner as a daily reminder to keep relationships purposeful. know when to take a break… I have a tendency to go until I am nearly on empty in order to accomplish all that I envision. This year I need to remind myself when to take a break. I hope to do this by keeping reality in check and having a realistic mindset. What are your goals for the new year? I'd love to hear them and perhaps add them to mine as well! I love these goals, Dorothy!! I always enjoying reading your blog posts. I saw in Twitter that you were asking for blog post requests. Could you please write a post about running, including what you wear on runs, how often you run, and tips for getting into running? Thanks so much! I just wrote a post on my goals for 2015 - I'd love if you checked it out! This is a great list, Dorothy! These are such great goals. I loved being involved in college and definitely encourage you to take all the opportunities you can. Some people might tell you to pick one thing but let me tell you when you graduate you will never have the same chances to get involved as you do in school. I really miss that about college life. So i say go for anything that interest you! Great list Dorothy! I hope 2015 brings you so much joy and happiness! Love these goals! Saving more is definitely something I have to work on, also. It's so easy to spend money - a shirt here, a coffee there - and before you know it, it adds up! I can't wait to read about what 2015 has in store for you!